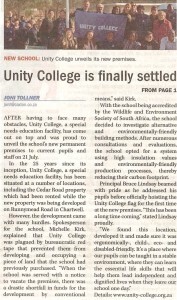 Unity College in the News! 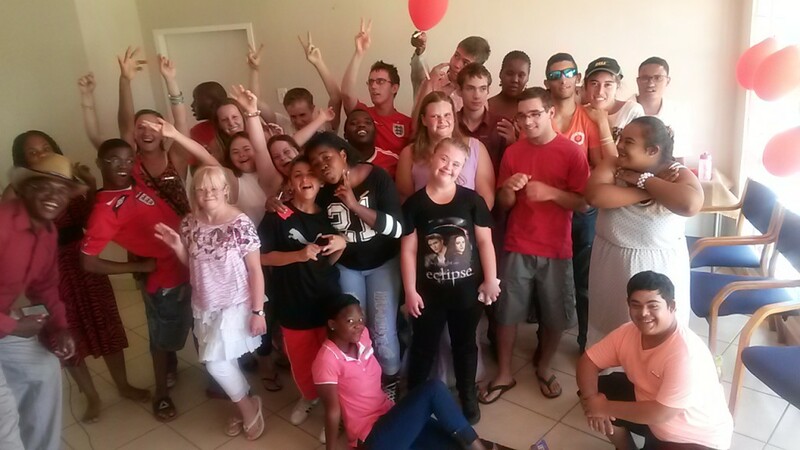 Eleven of our learners took part in the Special Olympics South Africa end of year Swimming Gala at Ellis Park 21 November 2016. These were finals and winners received medals and ribbons. 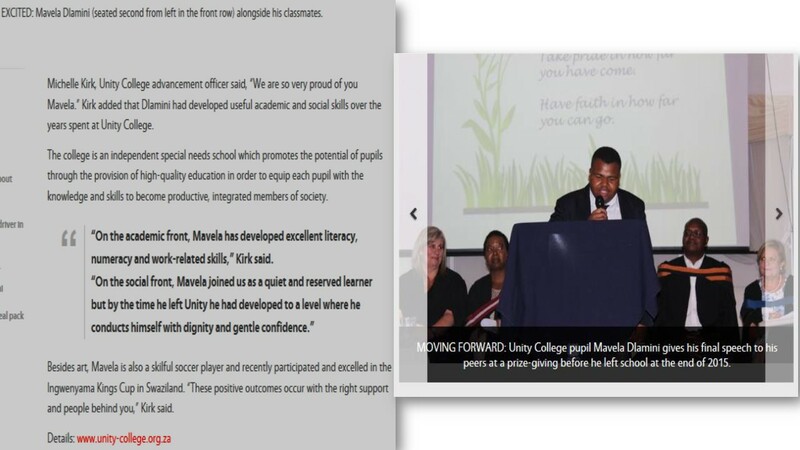 To read the full article please read here. Some pretty amazing recycled clothes designs can be seen at our 2015 concert. To see photos and more content, click here please. 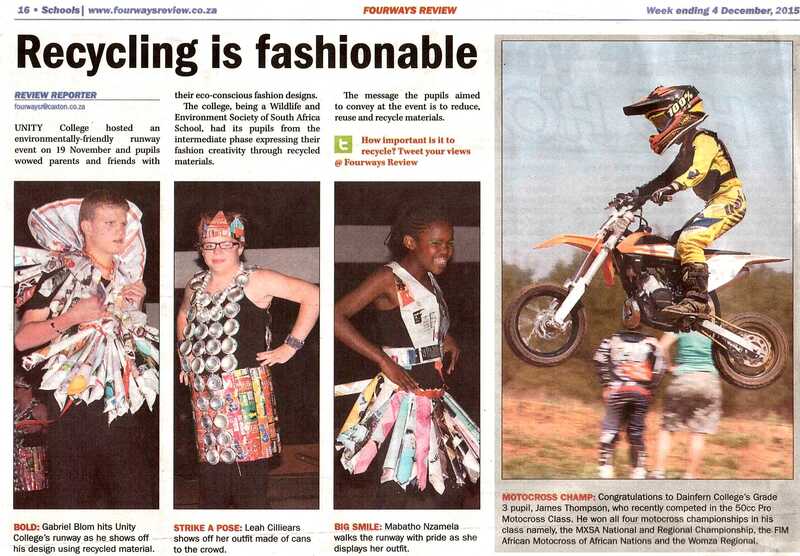 For the Fourways Review's article, read here, thank you. The Senior Cocktail Evening held on Thursday 19 November was a huge success. The theme this year was "Hawaiian". 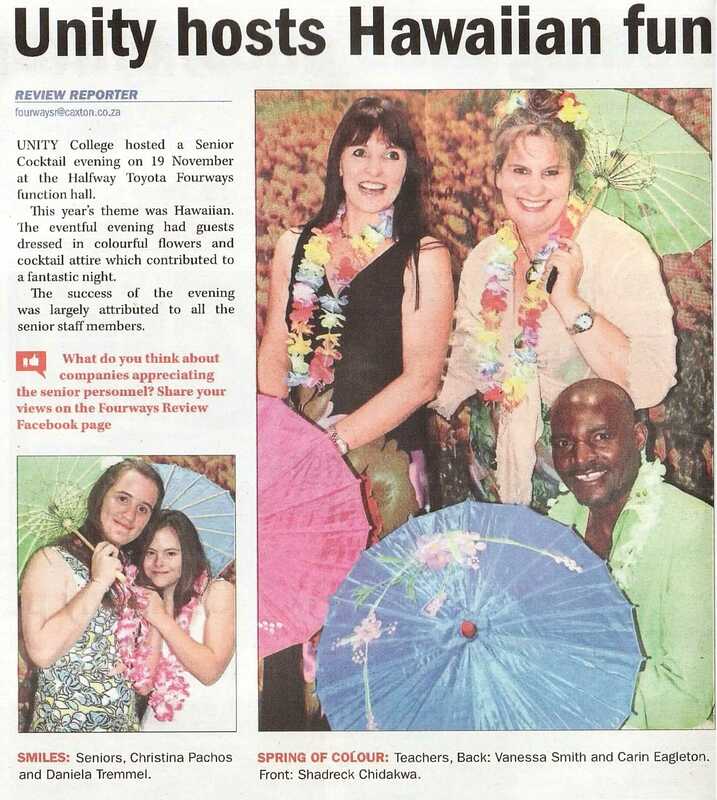 All enjoyed the colourful flowers and cocktail attire which contributed to a fantastic night. The success of the evening was in no small way largely attributed to the Senior Staff Members. 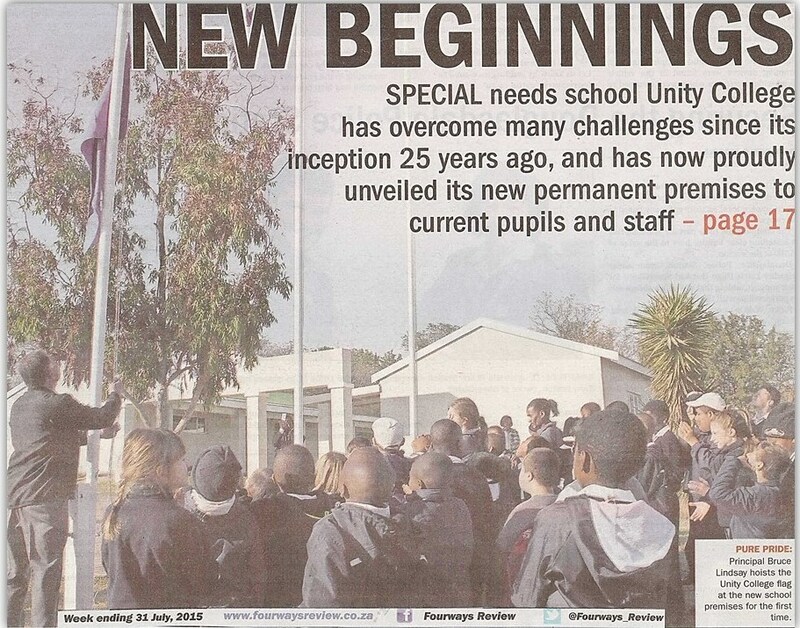 We would like to thank Halfway Toyota Fourways for their function hall at their premises in Fourways. 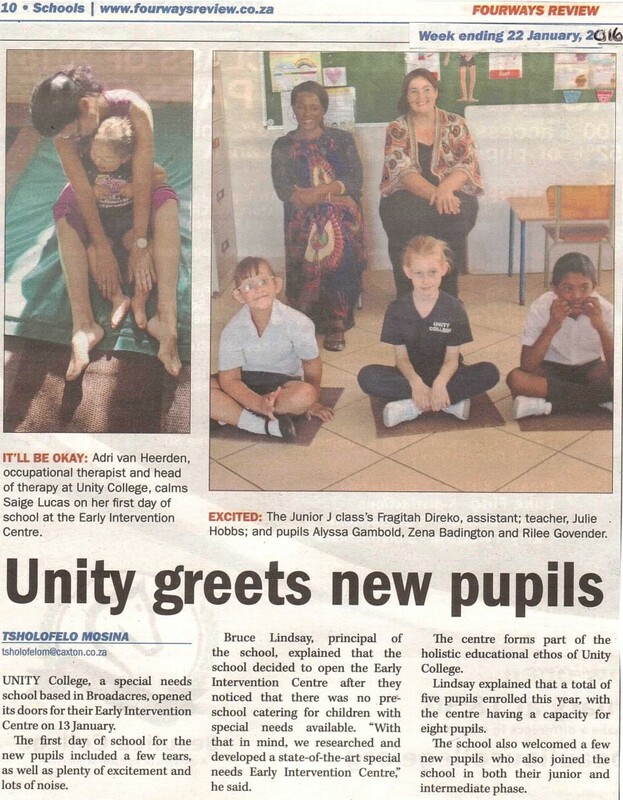 Unity hosted their first Mr | Miss Valentine’s Dance off at their new school Friday 12 February. 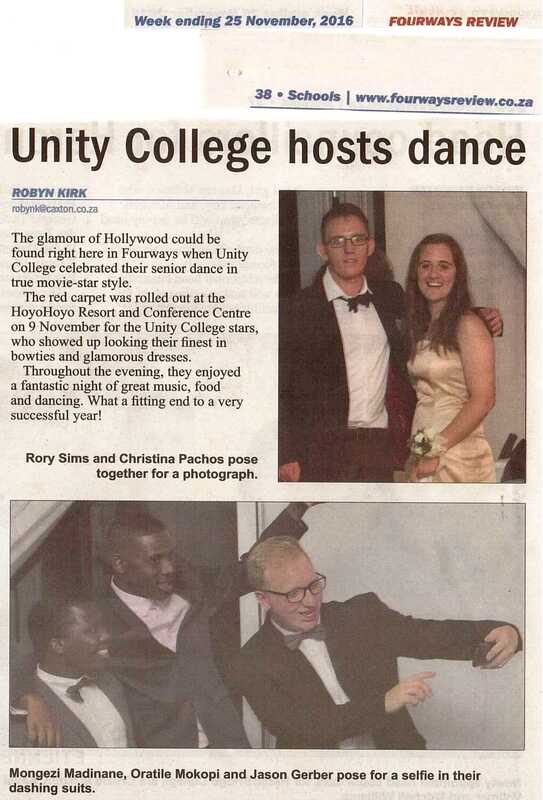 Fourways Review captured this Unity also hosted a Valentine's Social disco event for the Graduates and Seniors of the School which was well attended and enjoyed by ex students and current students alike. Unity College’s Interhouse Gala was held at Crawford Preparatory School in Fourways on Saturday 13 February 2016. 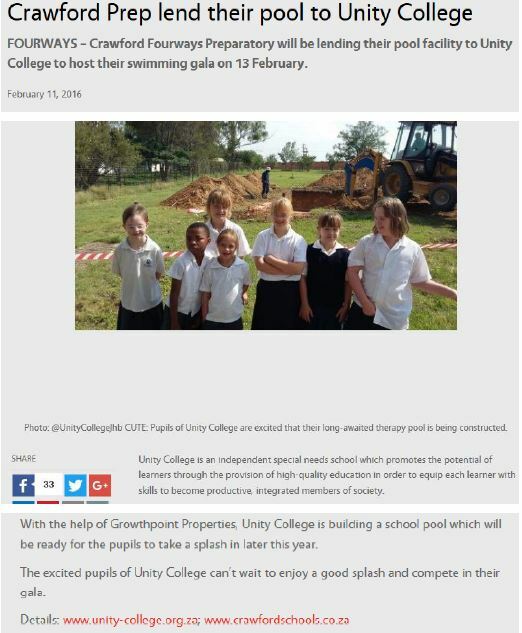 We are so grateful to Mr Ian Rothman, Principal of Crawford Fourways, for allowing us the use of their wonderful swimming pool facility. 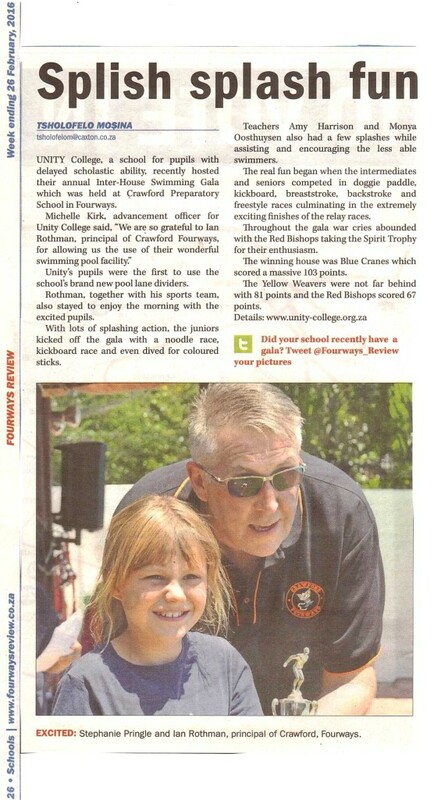 The Fourways Review captured the following. 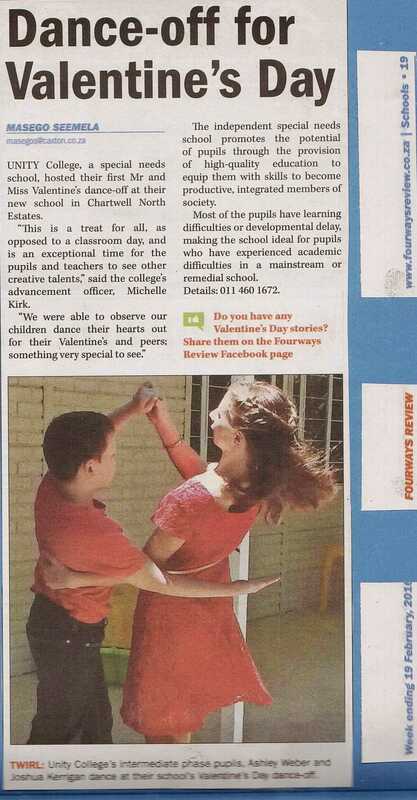 Crawford Preparatory School captured this. 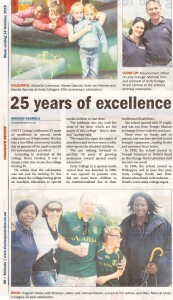 Crawford Fourways Preparatory helped us out before we had a pool by lending theirs for us to host our annual Gala in. What a treat using their beautiful facilities! 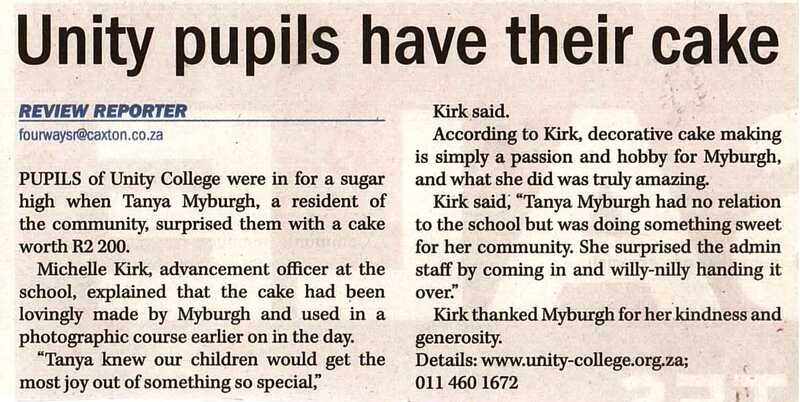 The Fourways Review captured the following. Our congratulations go to each and every athlete who performed on the day. Well done to the Blue Cranes for winning the coveted house trophy – its 9th win since 2004. 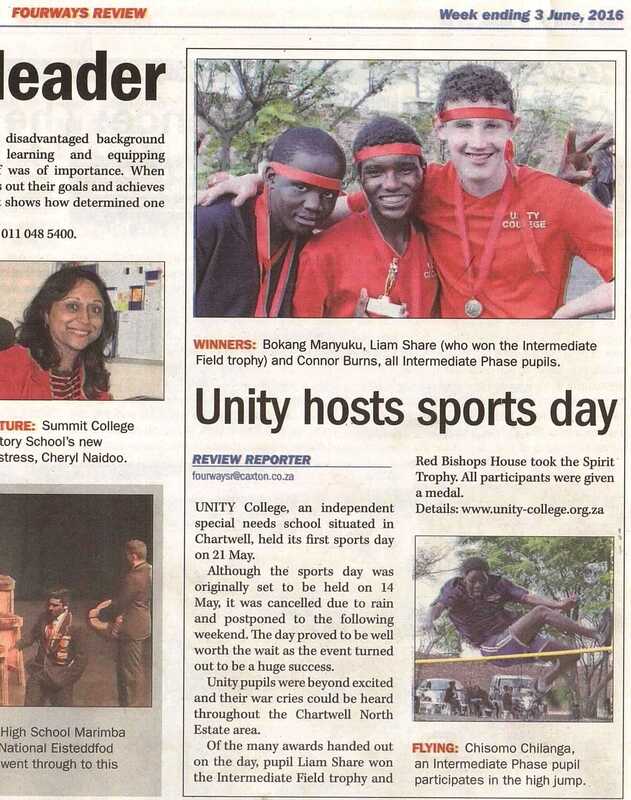 The Red Bishops were most vociferous under the leadership of Rory Sims and, deservedly, won the Spirit Trophy. House Scores were as follows: Blue Crane 134, Red Bishops 81 and Yellow Weavers 80! For other special mentions, please read the full story here. 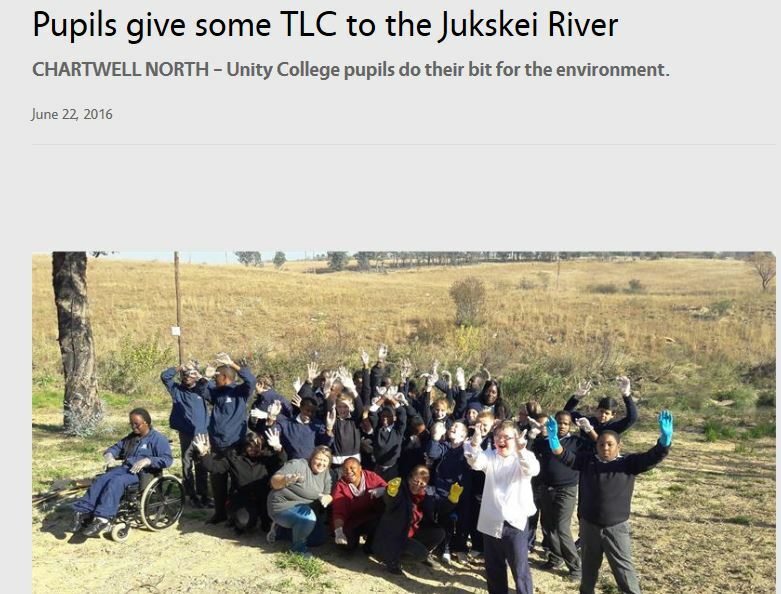 In preparation for Unity's Inaugural Big5Walk in June, the School's Intermediate Phase learners jumped at the opportunity to do a little sprucing of the rivers edges; rendering them free of litter washed down the river. 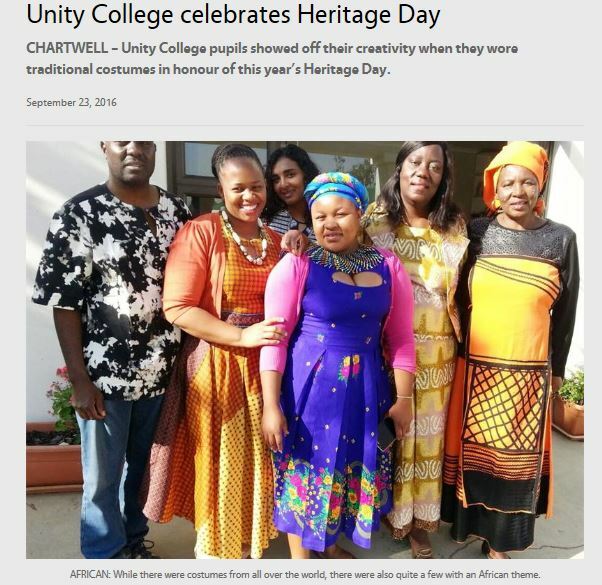 To read the full article, please click on the below image. 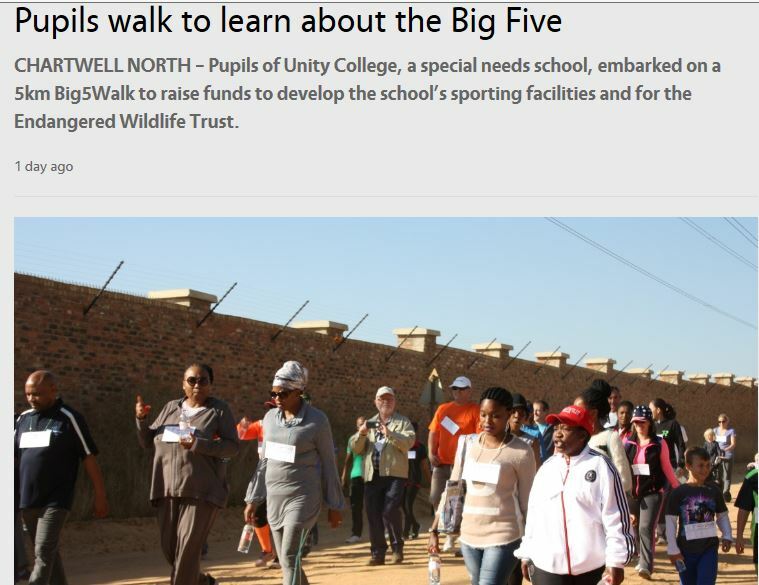 There is nothing quite like a winter morning's fresh air and walking to "save" your Big5! 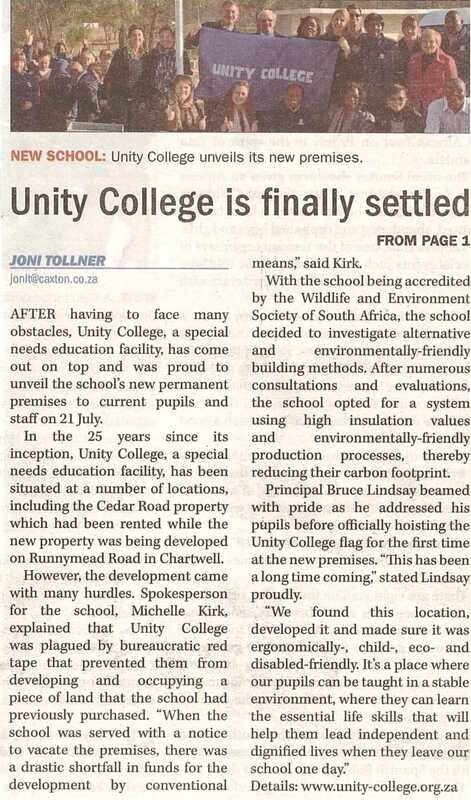 On the 11 June, both the Unity families and the Chartwell North Estates neighbours walked for this great cause! To read the full article, please click on the below image. 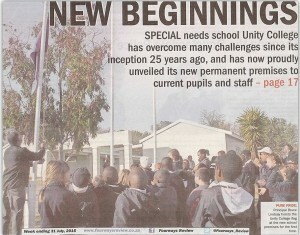 Spur runs a fundraiser evening for schools and other bodies wishing to raise funds. The "Shadow Shift" involves learners shadowing waiters while they go about their duties (taking orders, bringing food, clearing tables). 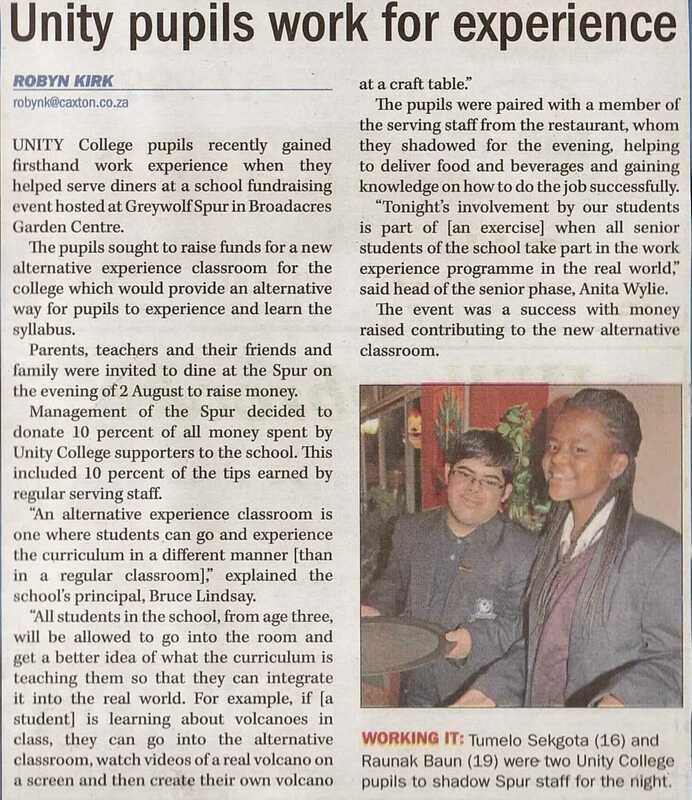 Spur gets customers, the school gets a percentage of takings, learners experience the job of waiting on tables and get tips, so everyone wins! Read the full article below. The online version can be read here. 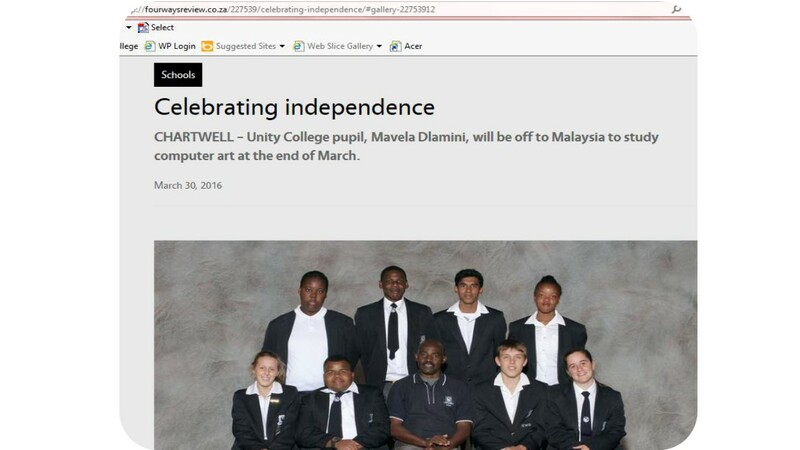 To know what Spur and Unity made from this fundraiser, the figures are in our 11 August 2016 newsletter.